Explore the traditional tastes of the Big Easy with this 3-hour New Orleans food tour through the city’s most delicious and historic neighborhoods. Get a glimpse into the city’s cuisine, history, culture, and architecture from classic jambalaya and po' boys to landmark hotels and historical buildings. Meet your guide at the French Market complex in the heart of New Orleans to begin your culinary exploration of this city's history. However many days you’re spending in the Crescent City, there’s no better way to start your visit than with the ultimate local food tour. Walk and eat your way through the streets of the French Quarter and visit Jackson Square in the heart of the city while your foodie guide entertains you with fun facts and points out famous sights. Tujague’s – This restaurant was previously a Spanish armory before it started slinging classic Creole dishes in an elegant setting famous for its rich history and delicious food. Come taste delicious red beans and rice, a NOLA favorite. Laura’s Pralines and Candies – New Orleans' oldest candy store, Laura’s, makes delicious Creole pralines and hand-made chocolates fresh daily in their French Quarter kitchen with recipes that date back to the 18th century. Laura’s also features Laura’s Creole and Cajun gourmet items for a taste of authentic New Orleans. Little Vic’s Rosticerria – Stop here to enjoy a traditional Muffaletta sandwich on homemade bread. Escape the noise and crowds of Bourbon Street by taking a short walk down to 719 Toulouse Street and experience a beautiful and peaceful Creole courtyard. Croissant D’Or Patisserie – This bakery, located in the heart of the French Quarter, has been serving New Orleans’ finest authentic French pastries for nearly thirty years. Nola Po-Boy – Nola's is a local favorite in the French Quarter dishing out some of the best seafood and po' boys in New Orleans. 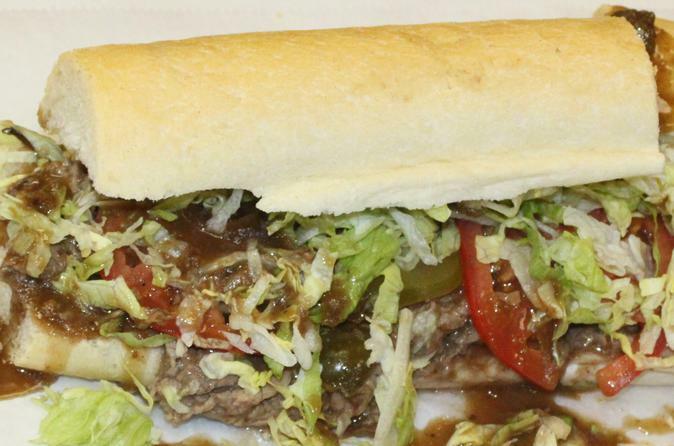 A hot roast beef po' boy, fully dressed, awaits you here. Cafe Fleur De Lis – Located in the historic French Market, Cafe Fleur De Lis is offering a great example of southern cooking experience. Get ready for a taste bud delight of shrimp and cheese grits. Fill up on some of the classic tastes of the Big Easy. The lunch bell ringeth!